While there is a lot of art I like, there is very little that can elicit a "Wow" from me. The acrylic and gouache paintings of David Grove almost always can. I have been continually amazed and inspired by David Grove's work since first seeing it in Communication Arts magazine more than 20 years ago. I'd like to see if his art has the same effect on you. Below is a book cover David painted within the last few years. I have no idea which part is gouache and which part is acrylic. I have no idea how he combines acrylic and gouache to get the images he does. What I do know is that it takes a great imagination and a good deal of thought to do what he does not only in this painting, but in all his art. Everything in the image is simplified and reduced to only what is absolutely necessary to tell the story and express the feeling he wants to convey. Look at the ship behind the man. It is mostly a few subtle shapes of color with a few strategically placed highlights. Yet you know exactly what it is. 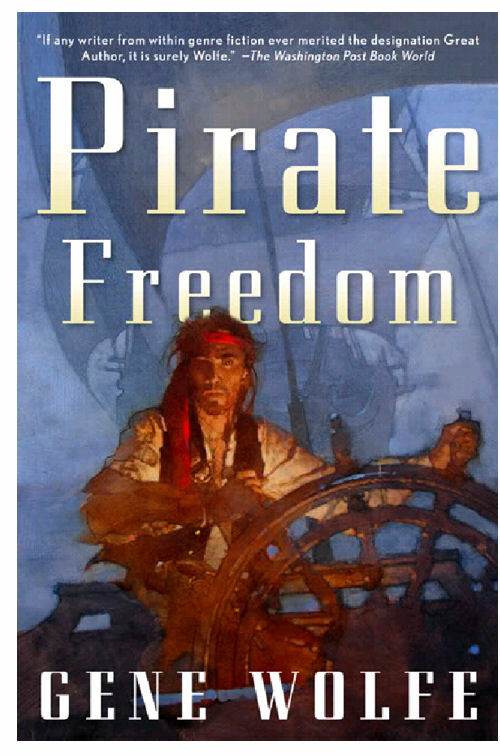 Look at how he establishes the pirate's face as the star of this picture. He puts the most intense color in the painting in the bandana around the pirate's head. And he uses the pirate's vest as the area of greatest contrast, so it will draw your eyes to the face. He doesn't waste time perfectly defining the bandana, he shows you the highlight of color and lets you imagine the rest. He doesn't waste time showing you the pirate's other eye. You know it's there. The vest disappears into the splash of reddish color from which the pirate and the helm spring. The helm is basically simple cylindrical shapes with strategically placed highlights to define it. There is mystery and visual surprise at work everywhere, because he doesn't tell you everything. He grabs your imagination and makes it get involved in the painting. That in itself takes imagination and a strong knowledge of simple shapes and how to define them. Learning to see the world as simple shapes, knowing how to draw and paint those shapes and nurturing your imagination are the cornerstones of creating great art. Trying to develop your talent and skills without a program emphasizing those cornerstones will not only hinder your growth, but it will also make it a harder, slower process to reach your dream for your art. But, look at what is possible when you have talent that has been developed. 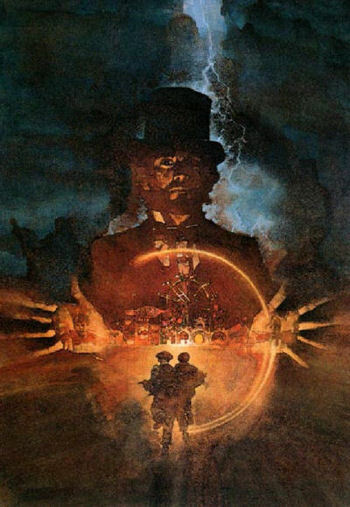 Below is an acrylic and gouache movie poster David Grove did many years ago for "Something Wicked This Way Comes," starring Clint Eastwood, I think. Here again is a striking image, very imaginative in its conception and design. And here again all the elements in the art have been simplified and reduced to no more than he needs to tell the story and convey the feeling he wants. 1. How can I use some of David Grove's ideas in my own work? 2. How can I bring more mystery, more visual surprise, more feeling to my work? It doesn't matter whether you use acrylic and gouache, oil, watercolor, pastel or stale coffee grounds to paint with. You can use ideas from David's paintings. You could be bold and do a dark washy sky to give the feeling of storm and power. You could focus the viewer's attention on the star of your picture by keeping the area around it simple. Look how David Grove made your eyes go first to the man's face, the star of this picture. Strong contrast grabs your attention. But, he goes further. He uses dramatic lighting and strong contrast in part of the man's face to focus your attention there. To help with that he keeps areas around the face (his hair, hat and coat) as simple shapes and mostly devoid of detail. He simplifies, especially in smaller areas. Look at the Ferris wheel. It is just some simple lighter shapes, just enough for your imagination to know what it is. 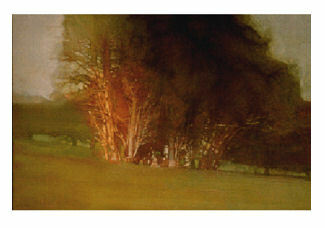 And in both of the above paintings and the ones below, look at his masterful use of color. 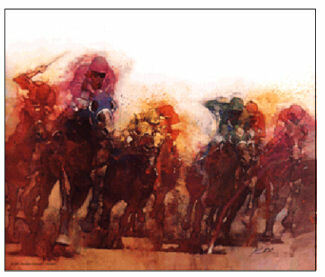 Look at the yellow and red acrylic or gouache underpainting in this horserace painting. It is allowed to show around the riders to increase the feeling of motion. Look how he creates a feeling of depth by making the lead horses and riders darker and their bodies more defined than the rest. You can just feel the excitement of thundering hooves rounding the final turn and heading toward the finish line. In contrast to the energy of the horserace look at the quiet little landscape below. It has the feel of a watercolor. If I hadn't told you what he uses, would you have known this was acrylic and gouache? The foreground grass and background trees are done very simply like they were created with a couple quick strokes of paint. Even the foliage of the trees in the center have a watercolor feel. It would be interesting to have David tell us how much work that actually took. The last thing I'd like you to notice is how on the left side of the trees David Grove has thrown in some reddish color to help draw your eyes to the sunlit tree trunks. Visual surprise. Look at how the trunks have a three-dimensional quality to them, but as they rise up into the foliage they become a flat olive-colored wash with a few sky holes. More visual surprise. That's not what you expect. And it all looks so simple, but, believe me, it can be hard work getting something to look this loose and simple. At their most basic all paintings are about using your imagination to create a good idea, drawing your idea well and putting the right colors with the right values (the lightness or darkness of colors) in the right places in your art. If you want to do that well, you can only be helped by studying these acrylic and gouache paintings by Hall of Fame illustrator David Grove. If you enjoyed this article and found David's work as adrenaline-inducing as I do, please tell your friends on Facebook and Twitter and send them a link to this page.